Oh, the excitement! On Rock Island’s normally staid downtown streets, where men wore suits and a woman was never seen without a hat, there were lions and tigers and bears…..and elephants. The circus was in town! As early as 1857, the Spaulding & Rogers circus arrived on nine cars of the newly built railroad to this little western outpost of Illinois. The next year saw the Vanamburgh Menageries. Other circuses came, too. In 1864, Dan Castello’s Great Show featured equestrians, gymnasts, acrobats, clowns, and jugglers. The Great Forepaugh Show was a regular in the 1870s and 1880s. Later, P.T. Barnum brought Bailey & Hutchinson’s Great London Circus featuring Tom Thumb and his equally dainty wife. Among the more curiously named circus was C. C. Coops New United Monster Show. By the time this postcard was published, one or more circuses visited each year. Many of the smaller circuses had fallen by the wayside leaving Ringling Brothers and Barnum & Bailey as the most prominent. Although advertised separately, since 1907 both were actually under the ownership of the seven Ringling brothers from Baraboo, Wisconsin. Circus trains typically unloaded at the foot of 17th Street, then paraded to their performance site. In early years, Bailey Davenport allowed the circus to use his pasture. Bailey’s 40-room “castle” was located near what is now 15th Street and 8th Avenue. North of 10th Avenue, his gardens extended to 7th Avenue, while the undeveloped pasture was the remainder of his property between 15th and 17th Streets all the way to 18th Avenue. After Bailey’s death in 1890, part of his pasture became today’s Longview Park, while his gardens were developed with hundreds of homes, leaving no place for the circus. The great shows were moved to the fairgrounds on the southwest corner of 18th Avenue and 12th Street. It was a longer walk for the animals and the performers, but the citizens loved every moment. The Argus lauded the mid-July, 1907, arrival of the five trains carrying the Ringling Brothers circus. The “longest richest street parade ever seen on earth” – reportedly two miles long — occurred every morning at 10 am, leaving from and returning to the fairgrounds where the tents were erected. There were a reported 60 acrobats, 60 aerialists, 50 clowns, and 60 riders as well as a calliope and five bands. The entourage was claimed to consist of an incredible 1280 persons, 650 horses, 40 elephants, and 100 cages holding lions, tigers and even a hippo. The free parade was a teaser for the show itself, which cost only 50 cents. In 1908, it was reported that the downtown merchants were “jubilant” as Barnum & Bailey’s circus parade brought “thousands of visitors” to the city and their stores. This circus claimed over 500 horses in the parade as well as 24 elephants and 18 camels. 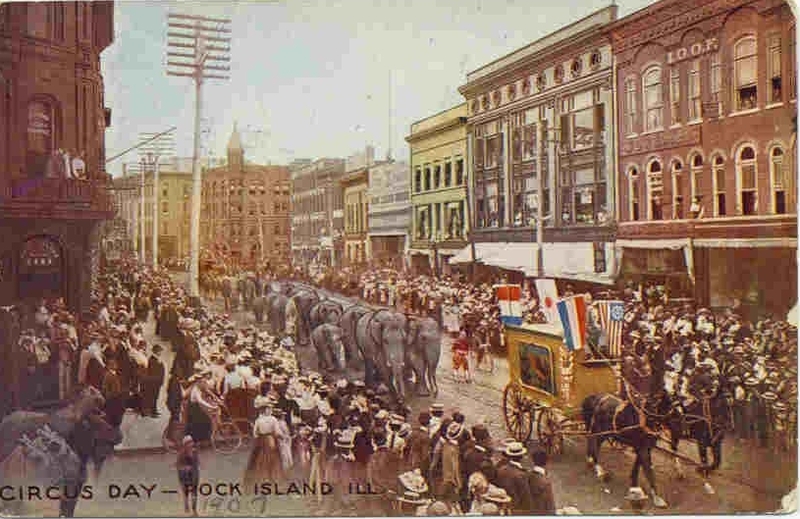 This postcard shows only a dozen or so elephants, although others may be elsewhere in the parade column. Rock Island’s circus performances often took place in July, and the dark-banded straw hats on the men and children confirm this parade is a summertime event. Despite the heat, the gents wore suits, while the ladies wore dark skirts, long sleeved shirtwaists, and flower trimmed hats. Notice the several horses standing in the lower left corner, ignored by the bystanders. Nearby is a lady bicyclist, garbed in the regulation long dark skirt, with another bicyclist partially hidden behind her. Someone has penciled in a date of 1907 under the title of the postcard, which is in the typical style of those published after 1905. In some cases, this means that the view is a “manufactured” montage, created by adding a parade to an earlier scene. The downtown view predates 1902, when today’s three-story blue London Building (now the home of Quad City Arts) was constructed. Other changes that took place not long after include the 1908 construction of the Best Building, now the Plaza Office Building, which replaced the Buford Block in the middle of the scene, and the 1904 addition of a fourth story to the Peoples National Bank, where the I. O. O. F. fraternity sign is shown on the postcard. Next door, the Fries Building, whose upper stories and circular windows were “unveiled” and restored a few years ago, looks much like it does today. This article, by Diane Oestreich, is slightly modified from the original, which appeared in the Rock Island Argus and Moline Dispatch on December 3, 2006.